The rapid development of technology in the modern world, offers wide opportunities for developing environmentally friendly and inexhaustible energy resources. Azerbaijan produced goods and services in the amount of 368.8 million manats ($217.01 million) in production, distribution and supply of electricity, gas and steam in January-February 2019. According to the State Statistics Committee, this makes 2.3 percent increase compared to the same period last year, Report informs. Production volumes in the sector of water supply, wastewater treatment and processing increased by 12.1 percent reaching 49.4 million manats ($29.07 million). During this period, the total electricity production in the country amounted to 4,178.7 million kWh, which is 1.4 percent more than last year's figure. Energy production at thermal power plants increased by 1.4 percent - up to 3,829.2 million kWh, at water power stations decreased by 1.8 percent - to 181.6 million kWh. For two months, 18.7 million kWh of wind energy was generated, which is 7.8 times more than in January-February 2018. During this period, the production of solar energy in the country increased by 15.9 percent and amounted to 5.1 million kWh. The capacity of the energy system of Azerbaijan is more than 6,000 megawatts. At the same time, according to the experts, the potential of renewable energy sources in the country is more than 25,300 megawatts. At present, 18 percent of electricity production in Azerbaijan fell on alternative energy sources, in which hydro power plants hold main share, although most of the country's potential in this area falls on solar energy (estimated at 5,000 megawatts). Some 4,500 megawatts accounts for wind power, 1,500 megawatts -- for biomass, 800 megawatts -- for geothermal energy, and the remaining 350 megawatts -- for the small hydro power plants (HPP). Aiming to lessen its dependency on oil, Azerbaijan carries out a number of measures for further development of alternative energy sector. There are plans to implement a number of projects totaling $2.3 billion in alternative energy. The projects include a plant for production of biofuels (pellet fuels) in the Sabirabad district, construction of wind power plants in the Pirallahi district, an agro-energy residential complex in the Samukh district and others. 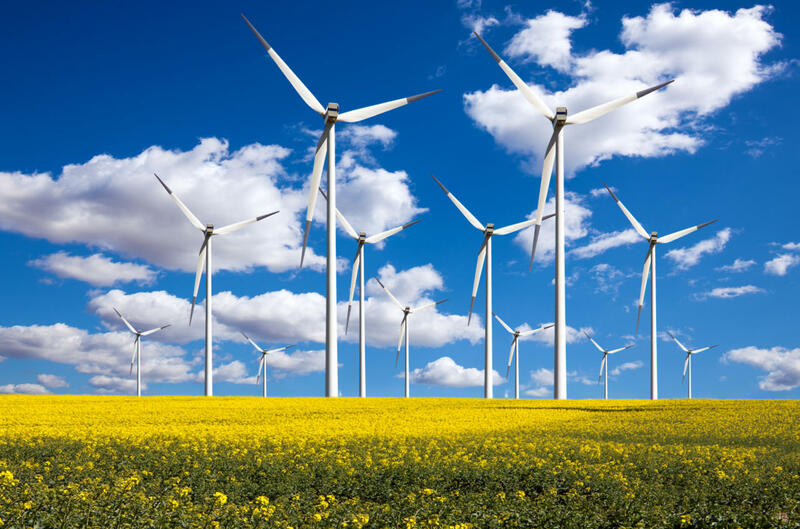 Construction of two wind power farms worth $800 million and $408.9 million in the Pirallahi district, as well as a wind power farm worth $377.7 million in the Khizi district are the biggest projects planned for implementation.